She has her life planned out. He lets the wind guide his sails. As the Cold War heats up, can they keep love alive on either side of the iron curtain? Finland, 1980. Kaisa has never been a risk taker. After graduation, she plans to marry the dependable older man who paid for her classes and kept a roof over her head. But when she accepts an invitation to a party at the British Embassy, a handsome naval officer makes her want to throw caution to the wind. She surprises herself when they share a passionate kiss under the stars and promise to see each other again. But how could she possibly give up her sure-thing relationship for a man she barely knows? When Peter Williams pictured his future, he saw a rising in the ranks and an endless trip around the world. Though when he meets the strong-willed Kaisa in Helsinki, his passion for the sea takes a serious turn. Not even the excitement of hunting down Russian submarines can compare to the thrill of his lips on hers. But despite his growing feelings, his commanding officers won’t tolerate him pursuing a woman from a Soviet-friendly nation. Both torn between impossible choices, Kaisa and Peter must search their souls for the right answer. With the Cold War heating up between them, can two star-crossed lovers find their courage or will their relationship sink on the high seas? The English Heart is a breathtaking contemporary women’s fiction novel with an undercurrent of romance. If you like vivid historical details, star-crossed chemistry, and complex characters, then you’ll love Helena Halme’s tale of Cold War romance. The English Heart is based on true events but all characters appearing in this work are fictitious. “I was so excited when The English Heart arrived that I started reading it the same night and couldn’t put it down so eventually put out the light at midnight, by which time I was halfway through. Last night I worked until 1:30am but had to find out what happened next so read until 2:30. I’m loving it! :-)” – Reader, by email. “I automatically give five stars to any book that has me staying up way past my bedtime to read it and abandoning anything else that I’m meant to be doing in order to get to the end, and this was one of those books.” – Debbie Young, author and Commissioning Editor Author Advice Centre, Alliance of Independent Authors. “The English Heart is subtitled “Can love go the distance” and it is quite the page-turner, I had difficulty stopping myself from devouring it in one go.” – Tania Hershman, award-winning author and poet, and editor of The Short Review. “This was a recommendation from my Finnish girlfriend. As a love story between a Finnish girl and an Englishman, it seemed quite apt really! Whilst perhaps not the genre I would usually read, I was compelled throughout, completing the book in a couple of days. I really loved the little touches of cross-cultural romance; I could definitely identify with several of the Englishman’s actions, for example making a sandwich out of the traditional Finnish snack of cheese, ham and rye bread! Not to mention hours spent wondering what your partner is doing or thinking in another country. Although I think my reading was enriched by my past visits to Tampere and Helsinki, I would certainly recommend this book to anyone who enjoys a good love story, particularly those who have experienced a long-distance relationship.” – A Goodreads reader. 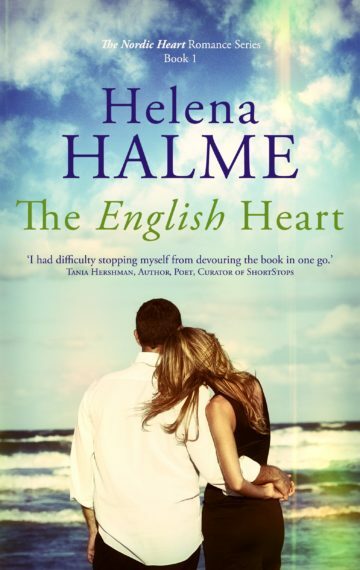 “Helena Halme, a Finn who grew up in Sweden, now writes in English. Her fictionalised memoirs give an insight into displacement, long-distance love, dysfunctional families, cultural differences between neighbouring countries, and the emotional journey of readjustment. Check out Coffee and Vodka and The Red King of Helsinki by the same author. As a perennial nomad, I identify. The light tones of romance and adventure are deceptive. Halme tackles awkward issues such as family problems, practical bureaucracy and the reality of prejudice. Identity, conscience, duty, relatives, friends, and the inescapable ties of love, whether benign or otherwise, her books have serious ballast. Yet the stories draw you in and only when you’ve finished a satisfying journey do you realise you’ve learned something. And this is an author writing in her THIRD language. ” – JJ Marsh, journalists, teacher, actor and author of the Beatrice Stubbs detective series. Interested? You can now download the Ebook version of The English Heart for absolutely FREE here!